Public reception for exhibition by Amy Harris and Deborah Pappenheimer, senior lecturers in art and visual culture, who for the past several years have collaborated in their studio work involving experimentation with various surface design processes — indigo vat dyeing, shibori, deconstructive screen printing, etc. — on both textiles and paper. The collaboration involves the exchange of partially made pieces back and forth, allowing each other to continue developing the work until both have agreed it is finished. Many of the processes they use, they are doing for the first time, an exercise in experimentation/chance taking and learning new things. 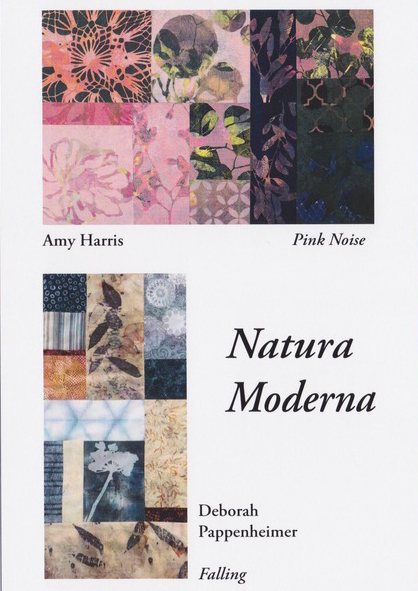 Their Natura Moderna exhibition, on display March 8 through April 27 at the Gallery in the Round, 1015 N. Hyland Ave., features the results of this continuing collaboration and much of their independent work.